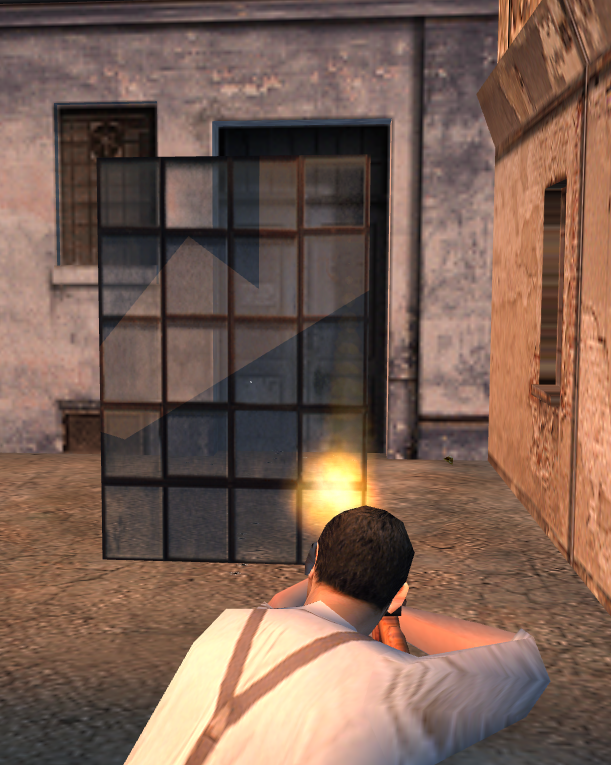 Mafiascene.com - View topic - What makes glass breakable? Posted: Tue Jun 26, 2018 1:41 pm Post subject: What makes glass breakable? For a while I've been wondering what makes breakable glass in Mafia breakable. I understand that part of it is an OBB collision (material 24), but I can't seem to replicate the broken glass falling to the ground like a physical object (on my model it just disappears when hit). 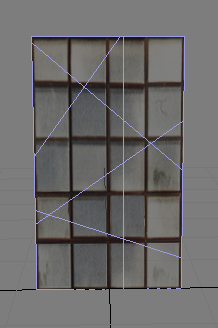 I'm also puzzled by the fact that the breakable glass panels inside the various scene.4ds models don't appear to be pre-fragmented in their meshes, so how does the game know where to make the 'breaks'? Evidently the break pattern differs between glass panels (Hotel Corleone doors vs skylight, for example). Posted: Sat Jun 30, 2018 4:06 pm Post subject: What makes glass breakable? It's a bug in MWE. See this post for details. You can fix the issue with a hex editor by looking for glass mesh's name in the klz file and changing the 01 that's located four bytes before the name to 02. Static breakable glass is typically prefractured into small individual meshes which are linked to OBB primitives with material 24. 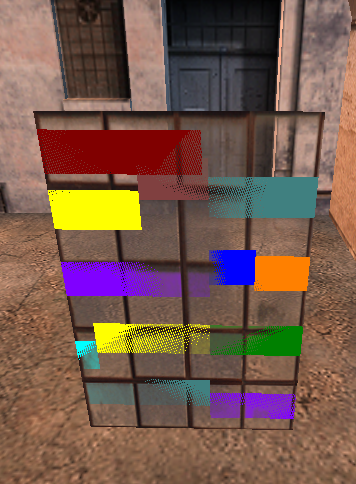 If the game detects a collision with one of these boxes, it deletes the corresponding box alongside the associated mesh and spawns the glass particles that fall to the ground. For doors the designers used the glass tag on the glass meshes. In case of mise08-hotel the glass panels and the wooden frames around them are a single mesh object which is why the whole construction breaks when it is hit. This is different from mise19-banka where the glass tiles of the doors are individual meshes and hence can be destroyed individually. Posted: Sun Jul 01, 2018 7:13 pm Post subject: What makes glass breakable? Thanks for the replies! Brokenneedle I haven't seen that before, I'm going to try making some custom damage models. ASM thanks very much! It's great to know how this works, i'll play around with it tonight. Posted: Tue Jul 03, 2018 12:52 pm Post subject: What makes glass breakable? So I tested it, and for some reason I can't get a custom model to smash (the physical collision works, you can't walk through it, but it doesn't take any hit collision) - oddly enough though, it works for all the models the game uses. The hex fix you suggested was applied for this test, but I even tried without it. Posted: Thu Jul 05, 2018 7:50 pm Post subject: What makes glass breakable? It doesn't work because OBBs are a different kind of collisions. They are not 3D objects but flat 2D planes lying horizontally, without height. In order to get it work you have to rotate them 90 degrees from horizontal to vertical. You might have noticed that all OBBs have 0,2 height scale (y axis). While they don't have any height it is important to keep it set like this. As the actual collision is in the middle and you can actually pick it up in MWE. So don't worry about collisions visually overlapping the objects. Each collision should be linked to a particular mesh as well. Posted: Thu Jul 05, 2018 10:16 pm Post subject: What makes glass breakable? What Duelist said. In case you use CTRL-K to create the OBBs I have a development build of MWE that generates properly rotated boxes. PM me if you're interested. I did some experiments and there seem to be additional requirements for breakable glass, though. In mise04-saliery it works perfectly for Mesh08 (a glass mesh part of one of the meeting room windows), door_dvuX01 (the door to the meeting room), @hqobr04.Box01 (the horse picture in the pool room) and plot_brana (the wooden gate at the entrance to the bar's backyard) but I was not able to get it to work for plot01 (one of the wooden fences in the backyard) for example: It is initially solid (as expected) but hitting it merely disables the collision detection; it does not spawn any glass particles nor does it delete the actual mesh object. Maybe the mesh itself needs to satisfy certain requirements, like a maximum number of faces? Posted: Mon Jul 16, 2018 10:45 pm Post subject: What makes glass breakable? As far as I remember, you need to add an extension to the model with hexeditor. To flag it as glass object. Then simply add a collider to it with Mafia world editor and it should break when you shoot at it. I remember djbozkosz is extremely advanced with these kind of things. You could try to leave him a message. I think besides changing the the 4ds file with hexeditor there isn’t really another way to achieve this.